The Big Island of Hawaii has many amazing and memorable drives to enjoy. We have done a lot of them but when asked which one is our favorite The Red Road in Puna is always my answer. The beauty in this drive is that it is visually pleasing as well as chock full of fun activities and unique experiences. In my opinion, the best way to get around the Big Island is by car. There are buses and taxis but having freedom to stop when you want for however long you want is vital especially in this rural area. We bought a car within days of arriving here as we immediately knew we'd need it! You'll probably start off in Hilo, where the main road is Rte 11. Head towards Volcano on that road and turn right onto Rte 130 heading towards Pahoa. If you have time or want to grab a quick bite to eat turn left into Pahoa town where you can see alternative lifestyles around every corner. There are Thai restaurants, pizza places, Mexican cuisine, and even a health store that has prepared meals available. Get back on Rte 130 until you hit a light where you will turn left onto Rte 132 and drive down that until you reach Rte 137. Turn right onto that and you will loop back around onto Rte 130 to head back towards Hilo. It's a nice loop road that takes probably 1-2 hours with no stops, 4+ if you hit all the diversion spots. There are many so pick and choose what interests you. If you have time start early and hit them all, I promise you won't be disappointed. After turning onto Rte 132 you will come to Lava Tree State Park pretty quickly. It is on your left hand side and well worth a 30 minute stop off. Here you will see what happens when fast flowing lava hits wet Ohi'a trees. When you first enter the walking path you will see 2 large chasms that were created during an explosive eruption back in 1790. Pretty amazing! The park is free of charge and also offers bathrooms. Even if you don't want to walk around I suggest you at least get out to stretch your legs, use the bathroom, and marvel at the beautiful monkey pod trees. They make a rain forest canopy like feel and are home to loads of birds and lizards. Once back on the road you'll drive through a couple of old lava flows before reaching your next stopping point. We like to get out and explore them as it never gets old to us how amazingly devastating and beautiful lava can be. The regrowth of the fields takes time but you can see it happening all around. When you turn right onto Rte 137 you will be passing by lava flows from 1955 and 1960 all regrowing albeit quite slowly. A word of caution though, if you plan to hike around be careful, these are really rough lava fields and there are no paths at all. I always have first aid supplies in the car when we head out exploring this area. If you want to take an even bigger diversion you can go straight at the intersection of Rtes 132 and 137. It is a dirt road but no need to have 4x4. When you drive down to the end of the road there is a light tower which marks the Eastern most point of the island, and the state of Hawaii. It is also supposed to have some of the most virgin air as our winds come from that direction, and have drifted for weeks over a landless area. One of our favorite spots in the area is next up on the diversion list. 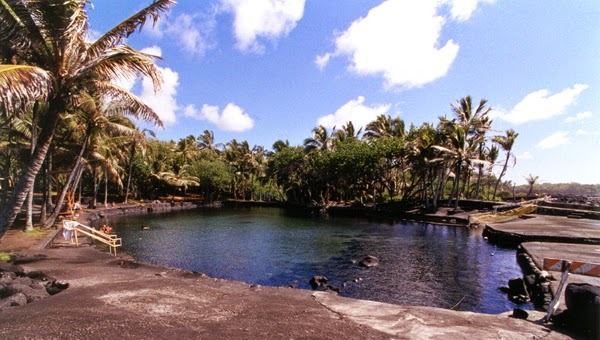 Kapoho is a small community with some of the biggest and most beautiful tide pools on the island. Kapoho has dozens upon dozens of spring fed pools, some are supposedly volcanically heated but we've never run into one of those, the water is usually quite cool. Not photo shopped at all! If you want to hit up the tide pools you'll want to take a left onto Kapoho Kai road, just before mile marker 9. Head down until you reach the first stop sign. Turn right and follow down (through one more stop sign) to the parking lot. The farther out you go the more colorful and life filled the pools will become. My suggestion is to park, put on reef shoes to protect your feet, and head slightly to the right. Those are the best of the pools in our opinion. Walk out as far as you can on the rocks and head in the water. 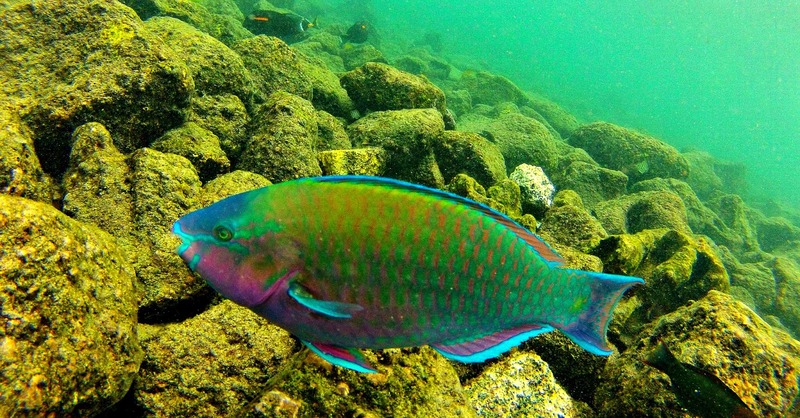 Bring a camera because you will most definitely see some amazing underwater sights. A bit further down you will see a yellow building on your left, turn in just after that to the parking area of Ahalanui. It will be located just past the mile 10 marker. Here you can relax in a warm spring and ocean fed pond directly in front of the crashing waves of the ocean. It is a really unique experience. Interestingly, the water used to be ice cold but after a 1960 eruption the lava flows changed everything and it is now a volcanically heated HOT pond. If you visit during the winter this can be a lovely reprieve from the chilly ocean water. The temp is supposed to be 90 degrees but I have been there when it felt much cooler and other times when it felt warmer. It all depends on the tide. If you want a quick surf then head to Pohoiki. I would only suggest it for someone who knows what they are doing though as lava rocks replace the sand making it dangerous when wiping out. The waves are generally not too large and you may get a few strange looks as it is mostly locals but really this is the only surf spot in the area. It is rocky but man it is so beautiful! This is another spot where the locals, mostly fisherman, may not be too welcoming but it is still worth a stop off. The swimming is not really any good here but there are lovely cliff side views and picnic areas for eating. If you walk to the right of the boat launch and go inland for about 3 minutes you'll come across a neat little spot that few people even know exists. There is a natural pool just feet from the ocean and like Ahalanui it is volcanically heated but far more private. During the week you are likely to have it all to yourself! Take your time here and really soak in all the beauty. Puna is the least explored area of the entire state. Kehena beach is fascinating for a couple of reasons. First of all it is a clothing optional beach so that always lead to interesting, umm, discoveries and titillating conversations with the kids. Once you get past all that nakedness the history of the beach comes into focus. It was created in 1955 by a lava flow, then sunk 3 feet in an instant during an earthquake in 1975. 3 feet! What must that have felt like?? There is no sign for the beach but just around mile marker 19 you will see a turn off where some cars will be parked. That's the beach! You will need to head over to the right of the parking area, which is really just a turn off, and head down the steps. The beach will be on your left. I would not suggest this beach for little children, the surf can be quite rough especially during high tide but black sand is interesting no matter what age you are. 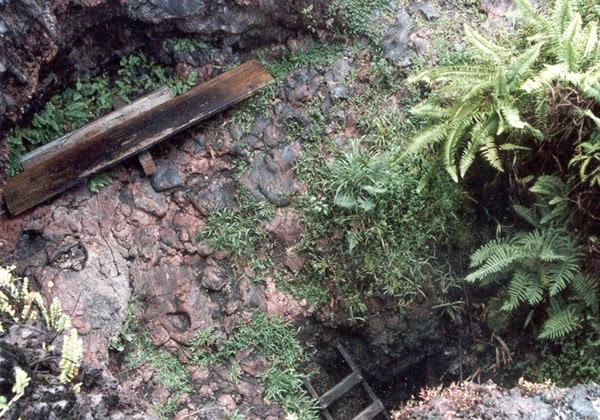 In a 1990 lava flow the town of Kalapana was basically destroyed. Kaimu beach, one of the most stunning black sand beaches in the world, disappeared. If you park at the end of the road you can walk out along the 1990 lava flow and you will see a very small black sand beach as Kaimu is returning slightly. There is a nice walking path and it will take you about 15-40 minutes to reach the beach depending on how much picture taking and exploring you and your children do along the way. Took us a full 40 minutes but we have nearly 100 pictures from that walk so it was certainly worth the extra time. Word to the wise, DO NOT swim there, the water is seriously dangerous! Rough breaks and even rougher currents in the water. There are vendors selling trinkets and small food and drink stands as well as bathrooms so this also makes a good resting point. If you can time it correctly there is a market and music on Wednesday evening right here. You can also follow the signs from this point to the Kalapana Viewing area. This is really neat as the subdivision that was there is now buried under lava (some people even live there still) so you can get some really unique shots in this area. The road is rough but again no need for 4x4. The signs tell you no trespassing but it is absolutely legal for you to drive through. In the evening, there can be lava glow, views of actual lava, or steam only depending on the lava flow that evening. Again worth stopping if you have the time. The viewing area is open until 9pm and it is a very short walk to reach the area. The church was formerly in Kalapana but was moved, literally ripped off its foundation and placed on a truck, in 1990 to where it sits now on Rte. 130 headed back towards Pahoa. I am not exactly sure if it is used as a church anymore but it is beautifully painted and makes for a quick stop off on the way back. You will find it on the right hand side of the road around mile marker 20. I am not even sure I should be mentioning this spot as there are no trespassing signs everywhere but we explored it and I know many people do. I don't suggest breaking the law just wanted to give you the info to make the decision for yourself. With that disclaimer out of the way you can find these steam vents on the right side of the road at the 15 mile marker. You will know you are there by the numerous signs telling you to stay out. There is a pull out there with a scenic overlook sign as well. If you do choose to venture in you will see a small path (roughly a minutes walk) to the Ohi'a trees. It may be a bit overgrown but you should be able to find it. From there you will see several small paths leading to different "rooms" with natural steam. If you stand still and look around just follow where ever you see steam rising. Some of the rooms have seats and everything. One of the more unique things I have seen here, again volcanically heated! Once you leave the steam vents just head straight up Rte 130 until you hit Rte 11, at which point you can head left to go to Volcano or right to go back to Hilo. Have you driven the Red Road in Puna? Did I miss any great spots to check out? I'm so glad we got the chance to rent a car and do this drive/check out the hot pools. I can't imagine seeing the Big Island any other way! We thrive on our own freedom/independence, and being able to stop at everything that caught our eye - especially on the red road, since it is so absolutely fascinating!! I agree, particularly here in Hawaii. There are just so many little nooks to explore! Great share. I may take one of my sons to Hawaii next year, and this gave ma some good ideas for the Big Island. Thanks! No problem! Taking your son to Hawaii sounds like a great plan. We love it here, every island has it's own vibe! It sure is. Sometimes we feel like we are on another planet! Love it! The first picture with the coconut plant is so beautiful. Colors of the plant are highlighting so nicely. Thanks so much! It is a really cool beach where a few years ago a woman started planting these coconuts to help facilitate the regrowth of the area.